Worried about offending your guests? Expecting a throng of sensitive teens? Don’t worry – we how to capture them without drawing giant noses, buck teeth, and sailboat ears. You don’t need to give your guests a complex when you give them a caricature. Christine Fusco, award-winning artist of the Blue Studios, has been caricaturing professionally for 18 years and can get an amazing likeness without mean over-exaggeration. And she’s fast – only about 3-4 minutes per person. No, this isn’t Paris, she’s right here in Central NJ! Do your Google search, check out all those gold stars and rave reviews, and then click here and book your party. Discounts available for 4+ hours or events in the immediate Green Brook area. Clients over the years include Merck, JP Morgan, AT&T Wireless, Aventis, and DKNY/Donna Karan. As a day job, Christine does illustration work for Johnson & Johnson. She is a two-time award winner on Caricaturama 3000, a caricature competition for famous illustrators and caricaturists worldwide. I have always been fascinated with faces – the expressions, bone structure, the uniqueness of each person and the variations within and between nationalities. I have explored the beauty of faces extensively on my journey to becoming a BFA while studying anatomy, life drawing, illustration, graphic design, drawing, painting and life drawing. While in college, I spent my summers working as a caricature artist at Six Flags Great Adventure in Jackson, NJ. While working there, so many people asked me if I was available for private parties that I printed up some business cards and The Blue Studios Caricatures was born. Whether it’s a graduation, wedding, new baby, family portrait or other event you’d like your guests to remember forever, I’d be delighted to apply that magical touch through amazing caricatures. 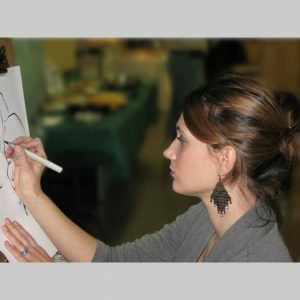 • SNAPsketch caricatures are the famous, quick party sketches created on-site at parties and events. Black and white and color is available, and you may choose either just headshots or full custom bodies. They are created on 11×17 paper with markers and chalk pastel. 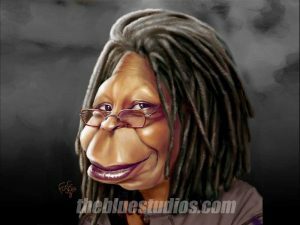 • StudioSNAP caricatures are similar to the SNAPsketches but are drawn from photos in my studio. They take about 1-3 hours to create and are usually given as gifts. They can be either drawn on paper or created in Illustrator and Photoshop. • HyperREAL caricatures take up to 40 hours to paint and are primarily used as illustrations or gifts. They are painted digitally and can be reproduced at any size. I worked at Kinko’s, JR Cigars and Cigar Magazine for a total of 8+ years of experience before striking out on my own as a freelance graphic designer. During this time, I developed my skills in logo creation, magazine design, advertising, package design, poster design, business cards… really anything you need! I am very proficient with Adobe’s Creative Suite and am considered by many as a Photoshop Master. I was the primary illustrator during my 6+ years working at JR Cigars and and Cigar Magazine. 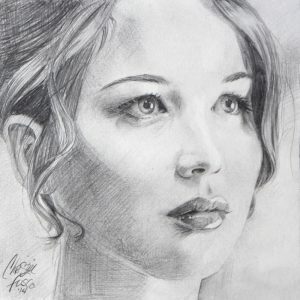 Perhaps my most intuitive and natural art is done in the simplicity of pencil on paper. Capturing the sensitive planes of the face and the individuality of the expression with complex gradients is my favorite type of artwork to create.